So you’re in the market for a new pair of high-tech night vision binoculars. There’s only one problem, after a quick google search for the best night vision goggles you realize there are an insane amount of options. Knowing this we spent the better part of last year field testing numerous models and brands of night vision devices, narrowing it down to our top 12 NVD’s. In this Firefield FF25023 Tracker Night Vision Binocular review, we are going to show you what about this model that impressed us. The Firefield FF25023 Tracker 2×24 night vision binocular (Click here to check price on Amazon) boast incredibly detailed observation ability, and excels under the darkest conditions. These night vision binoculars provide clear viewing in total darkness by using it’s built-in IR infrared illuminator. Similar to the Firefield Nightfall 2 and the Firefield Tracker 1×24 binoculars, the Firefield Tracker uses the illuminator to emit a pulsing frequency that is so energy efficient it actually reduces the amount of battery power required which prolongs the battery life. We were thoroughly impressed by the battery life on these tactical binoculars. The Firefield Tracker 2×24 night vision binoculars include a Built-In Pulse IR Unit that significantly improved viewing, as well as a no-hassle lens cap system and a super modern compact body. The Firefield Tracker is a generation 1 night vision device. While using these binoculars it quickly became obvious for us that the Firefield engineers kept versatility and comfort in mind when designing it’s Tracker series of night vision binoculars. We loved the ergonomically designed rubberized body and were surprised to discover that it was so lightweight. This makes it perfect for any long expeditions both easily as well as comfortably. The Firefield FF25023 uses the revolutionary Eclipse Lens Cover System which utilizesflip-upp covers that can be clipped against the body of the binoculars to eliminate lens cap hassles. This means no more constantly trying to swat them out of your way. The Firefield Tracker 2×24 Night Vision Binoculars have a magnification power of 2x and an objective lens of 24mm. This is great if you need to see long distances clearly in the dark. Another thing we really liked about these binoculars is that they have 12mm of eye cushion so wearing these is actually pretty comfortable. From our experience, we found with the use of the IR Illuminators it was possible to see approximately around 150 meters, although you can always turn off the magnification for short distance viewing. We found the clarity on these to be amazing for a gen 1 night vision device. Field of view, degree 30deg. Focus range, yard 1 to inf. Q: How long will these last on a full battery charge? A: You can squeeze out about 72 hours of battery life without the IR. Q: How far can you see in with these night vision binoculars? A: Up to 150 yards with magnification. Testing the Firefield FF25023 was a great experience. Because most night vision devices that we tested did not have magnification, this was fun to play around with. We also love how clear the picture is when you are viewing. 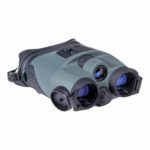 These night vision binoculars are a great choice for someone who is looking to engage in night activities in which distance needs to be kept, such as night hunting. If you found our Firefield FF25023 Tracker Night Vision Binocular review helpful please take a moment to share this post.